Pepsi has finally agreed with social media that there latest ad 'missed the mark' with second statement. Unless you've been living under a rock, you'll know that Kendall Jenner was the first model since Cindy Crawford in 1992 to have her own global Pepsi advertising campaign of which was released April 4th of this week. You should also know that the said ad which is evidently centred on protests became a global insult to real life protesters and just people in general, which ironically caused them to protest against Pepsi and the star of the show Kendall. 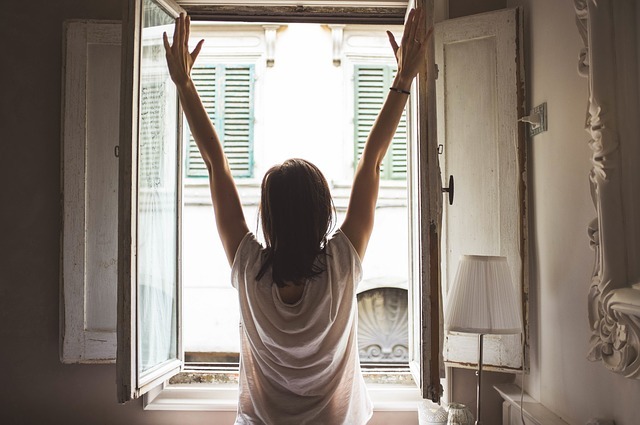 Within the social media realm, members of Twitter and Instagram banded together to create series of tweets and memes mocking the ad and expressing why the ad was of poor taste and not thought through. 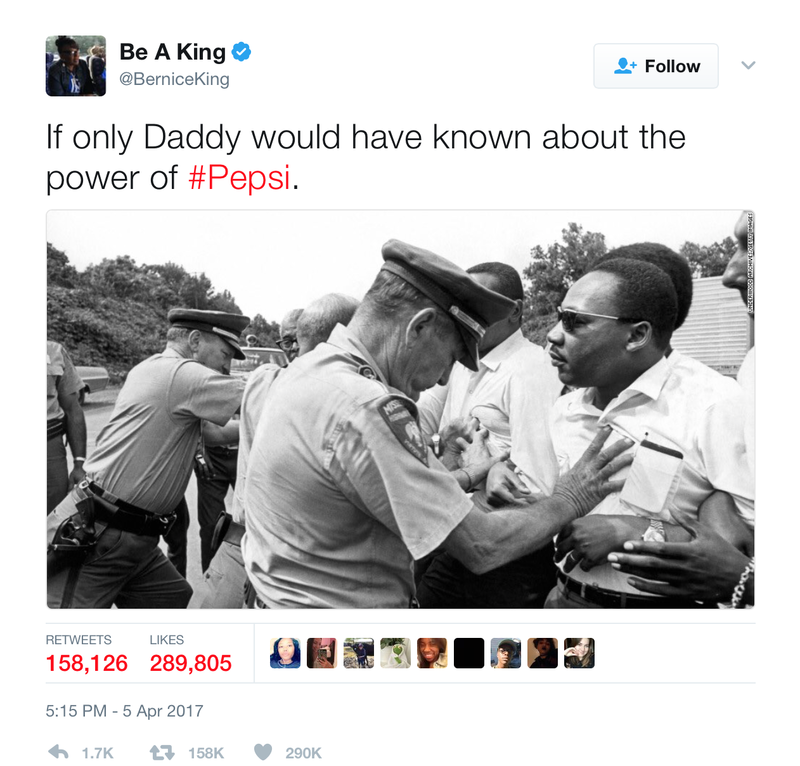 This included Bernice King the daughter of Martin Luther King Jr. She posted a photograph of her father in a protest with the tag, "If only daddy would've known about the power of #Pepsi". To add fuel to the fire the ad was released on April 4th marking the 49th anniversary of MLK's assassination. Very poor taste indeed! Only after the uproar, Pepsi has withdrawn the ad from it's campaign and issued a second statement after defending that the campaign "reflects people from different walks of life coming together in a spirit of harmony". 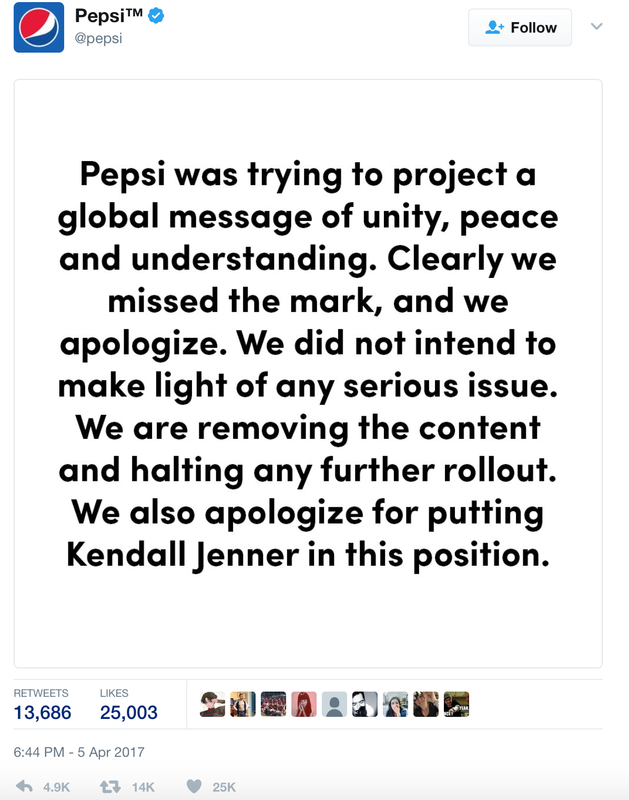 However marking the right to their wrongs, Pepsi now claim they "clearly missed the mark" and saved their talent in the process "We apologise for putting Kendall Jenner in this position". I expect Kris Jenner was all over this one as we know this act of sincerity is unheard of in showbiz companies are known for taking the talent down with them when stuff like this take place. Kendall was obviously criticised as people felt because she had never been to a protest or even contributed to the Black Lives Matter (BLM) movement she had no place trying to recreate one. Aesthetically a beautiful ad and not one for throwing dirt on the idea of wanting to create a space to show unity amongst all races of life. However, the solution of bringing a can of Pepsi to solve the problem was never going to digest well with anybody especially given the political climate and social injustices we currently see. Pepsi glamourised protests and made light of the situation which is everything but. Personally, I have not yet been to a live protest but I admire the people that have. It shows that they have strength and courage and are standing up for something that they believe in, and if you like myself are into social politics, you will be aware that protests, most often than none are never as smooth sailing and happy as the one portrayed. It was definitely a slap in the face. Now I don't have an answer for how this ad could've been better executed, however I do feel like they should've left that idea on the shelf. I mean come on, no one in pre production didn't say anything? or even when it was just an idea? The topic is too sensitive. My best advice would be for them to start using focus groups if they don't already. Maybe then they would've realised that they 'missed the mark' before it was too late.